Beauty and reverie...: Accessorize have shiny covered! Hello there dears! I promised reviews in my haul post and although I’ve been under the weather, I’m delivering quite a few swatches today from the Accessorize makeup range. 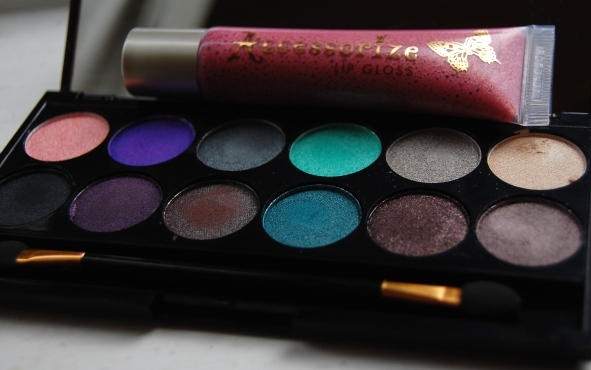 In the gift-set I got from Mike, were these 2.5g eye shadows for £2 together while they would usually have been priced at £4 each. 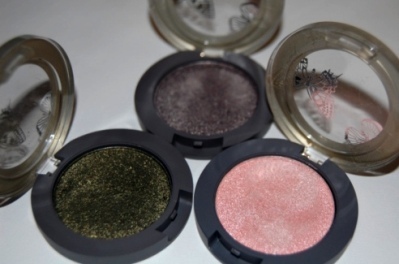 The casing for these solo eye shadows is practical, pretty and easy to open. All of the individual shades that I’ve seen have been shimmers so Accessorize must be sticking to their roots and favouring all things shiny! From left to right - ‘Baby pink’ is a very sheer shade with a definite shimmer and a rosy undertone. ‘Sage’ is my personal favourite and a smoky, rich metallic olive.‘Truffle’ is a shimmery taupe with a pink-grey undertone. When these shadows hit the light they have serious shine but they remain creamy not gritty with glitter. Whilst I experienced some creasing with ‘Sage’ when it was heavily applied, I can’t say the same for ‘Baby pink’ and ‘Truffle’ so I think they are quite reasonable on that front considering they are near-metallic shadows. Speaking of shiny, the swatch from the lipgloss says it all! The shade is a deep rosy pink with gold shimmer particles. While it is a deeper shade of pink than I expected, I think it is absolutely gorgeous and it creates a real impact... whilst smelling like cake too! My only hang-up about this product is the fact that when applying, some of the plastic edges to the packaging feel quite scratchy on my lips. I think that is a real shame for such an otherwise appealing product! I really think that this looks lovely on. Now in the palette, the shades names aren’t included but I’m sure most of them are from the existing collection and a little guesswork simply has to be employed. The wee spongey applicator included in the palette isn’t something I’d use regularly and the area around the shadows themselves seems to get quite dusty with residue. At least I can say that the mirror is very helpful! The exterior casing – although pretty – seems to pick up every piece of dust and finger print. However the contents is key here and the shades are fantastic! On the top row (starting from the left) there is definitely ‘Baby pink.’ This is followed by a bright purple, a grey-green, a pastel mint green, a light metallic silver-based shimmer and a light yellow based shimmer.On the bottom row (starting from the left again) there is a black, a black with purple shimmer, a rich red toned bronze, a blue with a hint of green, a dark brown with a copper shimmer and a shimmery taupe. While I would only describe a few of these shades as ‘duochrome’ (the black with purple highlights is definitely) I’d say that the fine shimmer particles definitely add an extra dimension when they hit the light. The only shade in the palette I felt was sub-par was the bright purple in the top row. 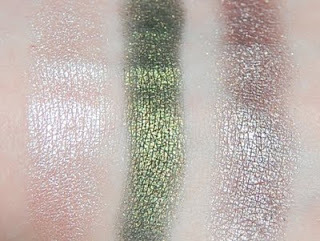 The shimmer in that shade wasn’t as defined and although the pigmentation was bright it had patchy coverage. 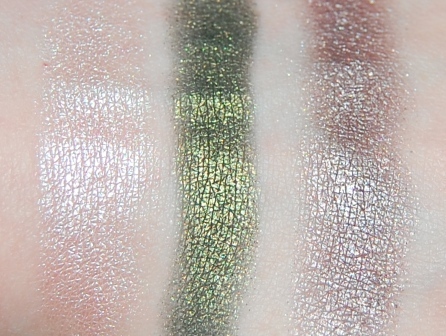 I think it is fair to say that it is the only 'dud' of all the shades I swatched so I'm willing to write it off. I think that Accessorize have really done well with these products. I find them really easy to use and exceptionally pretty. They may focus on the sparkly more than the understated, but these products really do offer a nice dose of girlie indulgence! PS. You can now contact me on Formspring and Twitter! Those solo shadows are such pretty colours! I keep meaning to try the new Accessorize range and you've inspired me to definitely try the eye shadow! I'm glad you like them! I can't believe how good they are, check if your local superdrug have that bundle deal still. Chances are they might! 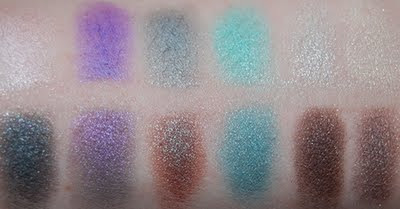 @wintergurl The shades shown are actually pretty muted compared to the rest of the range!